Eric C. Williams was born July 17, 1972 in Newark. He was one of three children raised by Patricia Williams as a single mother. Eric lived in the rough Hayes Home Projects, and was already getting into trouble before he was a teenager. Big for his age, he was often challenged by older kids. His response was usually a fist to the face. At age 11, he actually spent time in juvenile detention. Eric’s sport was baseball. As a high school sophomore, he was already being scouted by the Pirates and Padres as a shortstop. But heading into his junior year he sprouted 5 inches to 6’5” and suddenly basketball was on the radar. He transferred to Malcolm X. Shabazz High School, where he played organized ball for the first time as an 11th grader. He took to defense right away, and as he grew to 6’8” he began to draw attention from college coaches. Before he could compete at the Division-I level, Eric needed to boost his grades and polish the offensive side of his game. He attended Burlington County College in South Jersey for a year, then transferred to Vincennes University in Indiana—a school that served as a stepping stone for the likes of Bob McAdoo, Foots Walker and Shawn Marion. In 1993, at the age of 21, Eric transferred to Providence, where he played two seasons, leading the Friars in scoring both years. 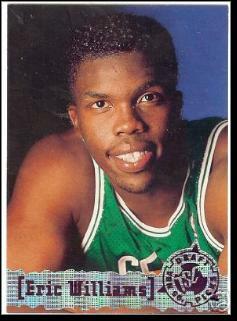 The Boston Celtics selected Eric with the 14th pick in the 1995 NBA Draft. He averaged 10.7 points off the bench as a rookie and 15.0 as a starter in his second season. In 1997, the Celtics sent Eric to the Denver Nuggets for two draft picks. He was injured during the 1997–98 season and for much of the following year, playing a total of just 42 games. He returned to the Celtics via trade prior to the 1999–00 campaign, and backed up forwards Paul Pierce and Antoine Walker. He worked his way back into the starting rotation in 2002–03. Eric concluded his career with the Cavs, Nets, Raptors, Kings and Bobcats as a defensive specialist, but could always be counted on for offense when a team needed it. As his career finished in 2006–07, Eric and his wife, Jennifer, became cast members of Basketball Wives. The VH1 series documented the difficulties in their relationship post-NBA, and in all likelihood contributed to their divorce. However, the experience also highlighted Eric’s acting ability. His goal is to balance careers in real estate and acting.